Peter J. Shaw – CEO, Akonix Systems, Inc.
Too many proposals, not enough wins. We are just not getting our fair share. Will our solution address the customer’s business problem? Are we leaving money on the table (appropriate up scope)? Do we understand the barriers to close? Do we understand the competition and have we differentiated our solution? Do we know the vendor’s selection criteria and the timeline for making a decision? Who are the key decision makers and influencers and their respective issues? Are we ahead or behind the competition on these issues? Who should we call on next? Have we established positive business relationships between our executive team and the customer’s executives? What is the plan for the next customer contact and do we know exactly what we are trying to accomplish? Answering these questions and closing deals are common challenges of all sales reps, especially those that are under performing. Increased pressure from sales management to work harder on closing the deal typically results in heightened frustration for the sales rep and sales manager yielding unsatisfactory outcomes. The idea behind the Deal Diagnostic is to quickly grasp the estimate of the situation to enable the sales rep to immediately begin working smarter not harder towards closing the deal. 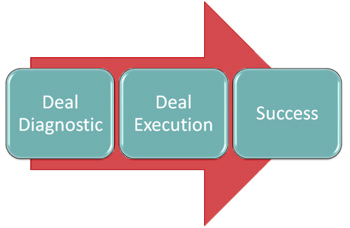 Following up with Deal Execution ensures that the sales rep and manager maintain this insight and discipline through the sales cycle. This proprietary process has been designed to enable the sales rep in conjunction with the sales manager to quickly arrive at agreement on the next right moves (strategy) for the opportunity and the most efficient way to execute those moves. The entire Deal Diagnostic process can be completed in under 2 hours. The process consists of completing a set of easy to use Deal Diagnostic templates. Building commitment across the team to execute the tasks and activities critical to the effective implementation of the strategy to close the business. Working with the team to update the Deal Diagnostic tools as the opportunity moves through the funnel. Providing insight on decision makers and decision influencers to overcome road blocks. Meeting with the sales team and sales management, providing feedback on lessons learned.